It's taken two library systems to get me caught up on Zander Cannon's giant-monsters-in-prison comic series, and that seems a lot more complicated than it should be. But any system that gets books you want to read into your hands is, in the end, a successful system -- so I'm not going to complain. 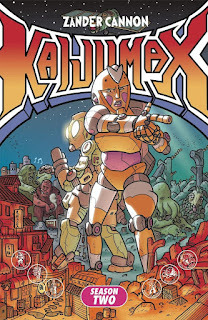 So: here is Kaijumax, Season Two: The Seamy Underbelly. Electrogor, the nice guy who looked like our main character back at the beginning of the first season, has broken out of prison with Green Humongo, and the two of them are hiding out with Red Humongo, who is Green's brother despite their having completely different origins. But the cast of characters is much wider than just our two fugitives, and they're scattered all over the place -- I'd say "around the world," but one of them spends substantial time on what I'm pretty sure is the moon. Cannon has backed his way into something like a racial allegory, though he has an afterword where he denies that was the point, and explains that the parallels came as he turned "giant monsters in prison" into something more than just a joke idea by trying to take it seriously. I found it an interesting strand of the story -- kaiju as a minority group, dispossessed and discriminated against, and the family dramas between the cop kaiju brother and the criminal kaiju brother. I'm not part of the racial group that the kaiju mostly reference, so I can point to that element and note it, but readers who are closer to a real-world version could have very different responses. And it's a noirish cartoon version of every monster movie ever, too: giant piloted robots and giant self-aware robots, lizards from the depths of the ocean and Lovecraftian beasts from between the stars, demons and mad scientists and scheming sons. It's only because the monsters are so apt to get addicted (to nuclear power, to fictional monster-drugs) that this world even still exists. Season Two is darker than the first one, almost paradoxically, since this is the storyline taking place almost entirely outside of prison. But prison is where things are relatively simple, right? You follow the rules (official and unwritten), you keep your nose out of places it shouldn't be, you keep your head down, and you do your time. There's no place to keep your head down in the wider world, and everywhere your nose is could be a place it shouldn't be. 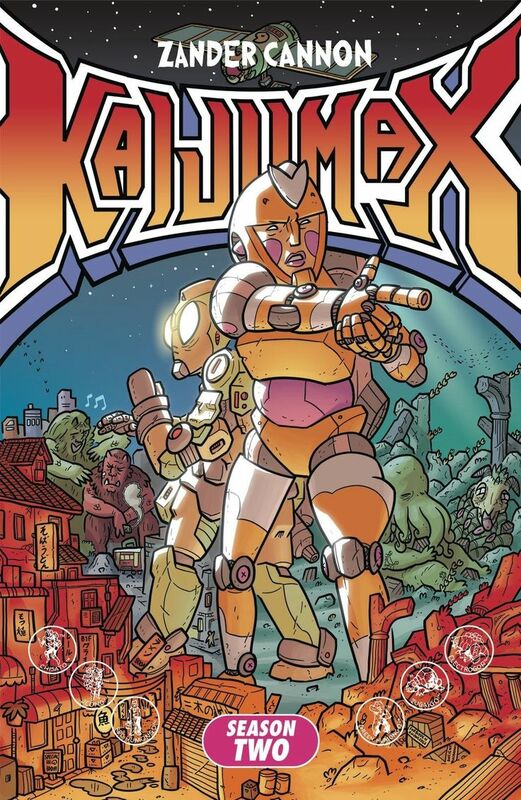 You have to be able to take Kaijumax seriously to enjoy it -- to accept the premise, admit the science is severely bent at best, and appreciate the models. If you can do that, it's a fine comic about loyalty and friendship, good and evil, what you have to do and what you can do, and, as the first book put it, terror and respect.